A captivating and fast-paced account of the rise of Ruffhouse Records’ founder Chris Schwartz, the coming of age of hip-hop, and the trials and tribulations of some of its greatest artists. As a homeless musician struggling to catch a break in 1980s Philadelphia, Schwartz navigates the criminally infested, morally bankrupt independent record business to build one of the most successful hip-hop record companies in the world, which dominated the charts and generated global revenues of over one billion dollars. 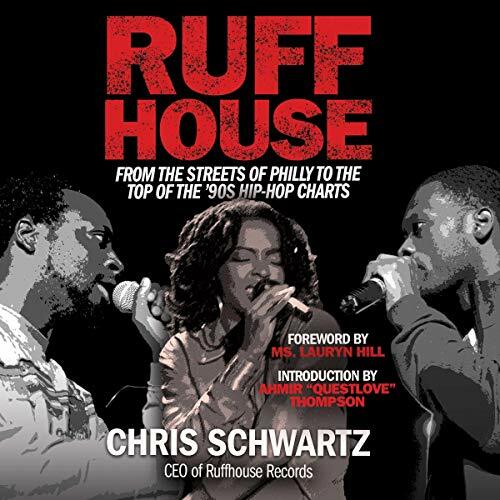 From the streets of Philly to the board rooms of the major record companies like Sony Music and Warner Brothers, Schwartz builds Ruffhouse from one desk and a phone to one of hip-hop’s most revered record companies while struggling with drug addiction and alcoholism. A story of money, greed, envy, betrayal, violence, addiction, loss, and redemption, Ruffhouse reveals the inside of the record companies, recording studios, tour buses, private jets, mansions, radio stations, and concert halls at the height of hip-hop’s hayday, while also uncovering the darker side of the business, from police stations to rehabs, from courtrooms to jail. Narrated in candid, searing prose, Ruffhouse is a true portrayal of hip-hop music culture and its transition to global commerce. ©2019 by Christopher Schwartz. © 2019 by Ms. Lauryn Hill. (P)2019 Brilliance Publishing, Inc., all rights reserved.